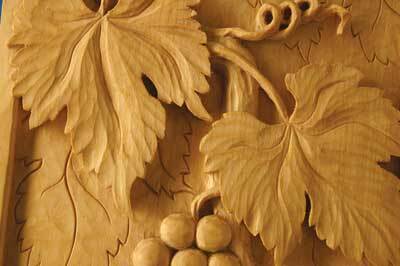 Leaves are the most common decorative motif in ornamental history, so it is incumbent upon the decorative woodcarver to explore the incredible variety of leaf shapes, their arrangements on branches and vines, and their associated flowers, fruits, and seeds. Because we perceive outline more readily than form, the outline or silhouette must be easily read. Visual aspects are determined by the general principles of design such as balance, distribution, and proportion, which lend their qualities for an over-all pleasing representation. Because many elements from nature are extremely thin like leaves, it is difficult to portray them literally in our chosen material of wood. You must ask, does the design adequately illustrate the mass necessary to support the elements? 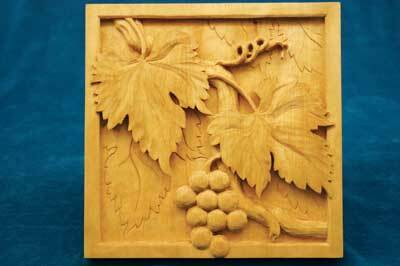 To design for woodcarving you need to know something of the techniques of the art. 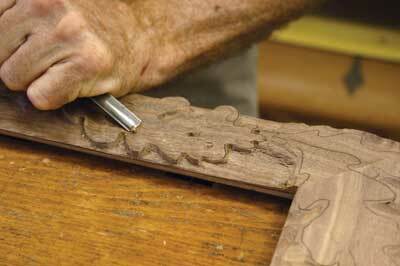 Close observation of your subject matter is necessary to carve a convincing piece, even if interpreted or stylised. The best way to obtain the essence of an object is to know all aspects of it. There are two types of trees: the gymnosperms whose leaves are needle-like, linear or scaly, and often called evergreens. The seeds are 'naked', usually on the scale of a cone. The second group is the angiosperms. Their leaves are generally broad and flat. They are the flowering plants whose seeds are enclosed in a vessel, often fleshy. 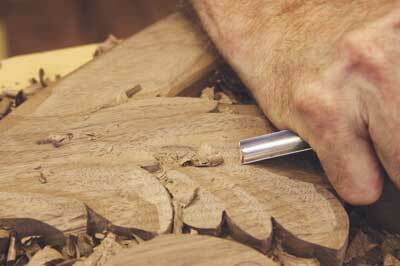 In preparing a design you must first determine the measurements of the area to be carved, which of course, may be dictated by its intended use. 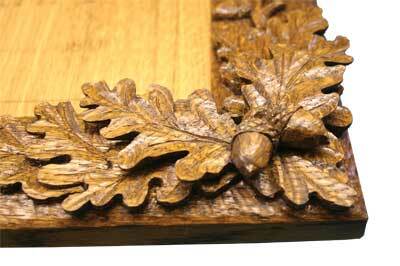 The design should have an interior logic - for instance, the oak leaf mirror frame in photo 1 has a branch winding around the frame as a skeleton upon which are clusters of leaves, with occasional twigs and acorns. Though the continuous branch is not realistic, the viewer accepts the convention. The effectiveness of the design can also depend on context. 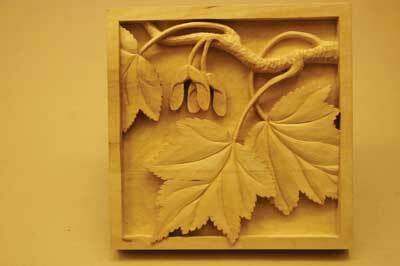 Compare the grape leaf carving - see photo 2 - with that of the maple leaf - see photo 3. The leaf shapes are similar, but the accompanying grapes in one and the samaras - winged seeds - in the other, clearly differentiate them. In depicting foliage, one obvious problem is in carving the stem - petiole, which can often be long and thin. There are several ways to anticipate and avoid breakage. The first would be to have these delicate sections lying on the ground - or even just incised into the ground. 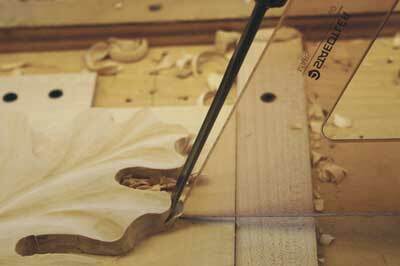 Another idea is to attempt to align the delicate sections along the direction of the grain. Yet another idea is to limit the length of delicate sections by having the petiole cross more substantial branches or other stems - see photo 4. In fact, long petioles can lie right on the branch. 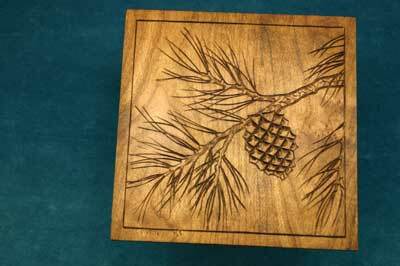 The needles of pine are difficult to represent sculpturally so probably the most effective way to represent them is to incise them into the surface of the wood as a line drawing - see photo 5. So recognisable are leaves and some so geometrically simple in outline that they seem almost generic by nature. Consequently, they can be depicted in flat carving, differentiated from the background by punching or texturing. Unless such leaves serve as 'filler' - diaper - or as a repetitive pattern for more interesting elements, this is not very engaging. 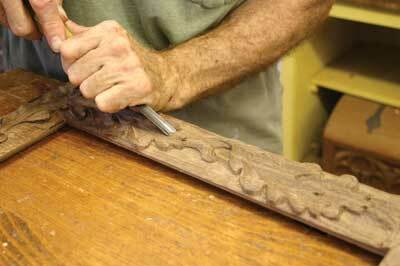 You can, however, have an effective carving with only low relief. As a general principle, the more depth of relief, the more realism can be achieved. 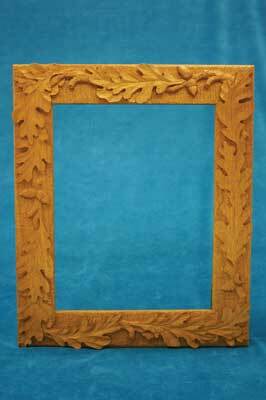 Low relief - basso-relievo - allows for overlapping leaves, branches with twigs and acorns - see photos 6-7. 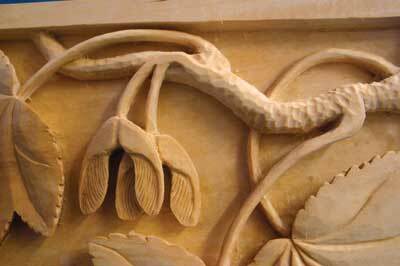 As with most relief carving, the shape of the leaf is defined by setting-in and is made to have thickness by taking down the ground - no matter how slight - but much of the liveliness of foliage relies on how the surface is modelled. The skeleton of the leaf is the venation, or arrangement of veins. For the most part, tree leaves have a central vein extending the petiole to the extremity of the leaf, and secondary veins extending to the end of each lobe. Though there is a diminishing network of veins throughout the leaf, usually only the primary and secondary ones are carved. The undulations of the leaf follow this venation scheme with rounded valleys where the veins are and rising where they are least visible; that is, between lobes. 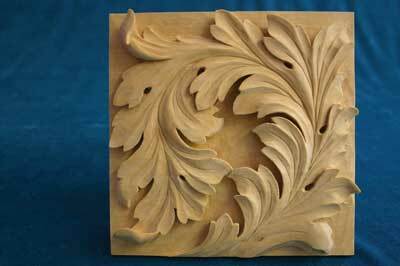 This usually works for deciduous leaves and is a well-accepted approach for the acanthus leaf and other stylised leaves - see photo 8. After this overall modelling is completed, the surface of the leaf needs attention. Some leaves are quite smooth while others are almost pebbly. The more stylised a leaf the less need to texture the surface in a naturalistic way, and less need for details like veins. Most depictions of acanthus leaves show smooth undulations - see photo 9, though the actual plant is naturally more complicated. Compare the leaves in photos 9 and 10. The texture of the leaf in photo 10 is more realistic in that it suggests the texture of the natural leaf. In any case, consistency in the individual cuts is advisable. The curled ends of leaves are, for the most part, an artistic invention unless showing a diseased or dried leaf. 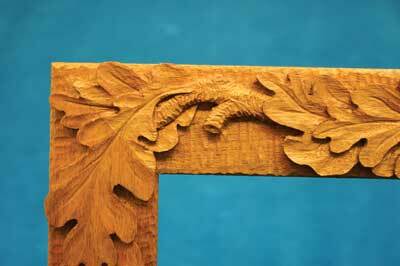 In stylised leaves, doing this adds verve and depth to the carving - see photo 9. Having contorted leaves may detract from 'readability'. As important as the silhouette of a leaf is, the venation of it is often the critical clue as to how to model the surface â€“ and even identify its species. Veins, though they are actually more pronounced on the reverse or underneath side of the leaf, do show on the obverse by slight convexity, smooth flat lines or by a colour difference. The veins become narrower as they near the end of the lobe and should be carved more shallowly, so they seem to fade out well away from the edge of the leaf. The woodcarver's U-shaped veiner provides a soft look to the veining, though a parting tool is entirely appropriate to emphasise a deeply furrowed leaf, or one with a spiky outline such as a thistle - see photo 11. Several techniques can enhance the low relief treatment of foliage. If relief warrants, the technique of undercutting can be used to 'lift' the leaf from the ground, or to separate leaves from each other when layered - see photo 12. Here, the 60° drafting triangle shows the necessary angle for undercutting, but the angle could be less. Another way is to combine several techniques such as incising the silhouettes of leaves into the ground - see photo 13 - so that the primary relief seems to be only the foremost member of a group. The idea could include a combination of low, medium and high relief - even possibly layering a pierced carving over a low relief. Another enhancement is to do more or less the opposite by applying leaves to a low relief thus adding depth - see photo 14. Yet another idea is to consider the function of borders. A raised border restrains the foliage so in having leaf tips overlap, it may lend fluidity and realism to the subject. Even an incised line, with or without texturing may emphasise the difference between leaf and background. 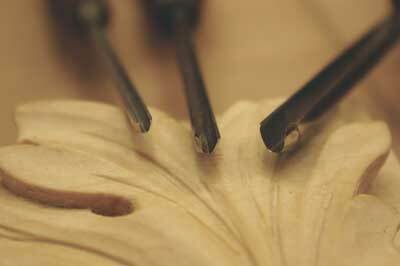 Remember that much of the effectiveness of woodcarving is the suggestion of realism, the capture of the essence of the object. The best way to develop technique is to understand your tools, what they are designed to do, and how to effectively use them to execute your design. 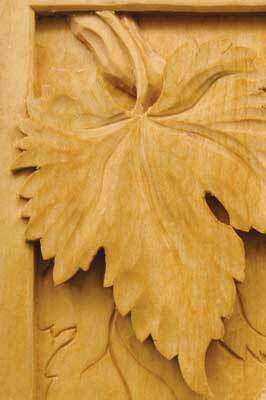 Practice carving 'specimen' or single leaves, followed by creating 'clusters of leaves' that overlap each other. Knowing the objectives and potential problems of a design, will often determine the technique to be used.